We offer you the unique possibility to absolve your required flight hours in a flight simulator according to international requirements! 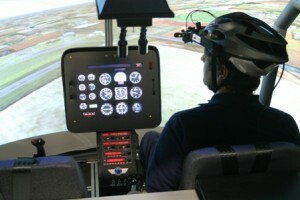 The procedure trainer was developed by AEROSIMULTORS in Belgium and is used by many police training facilities in Europe and USA. 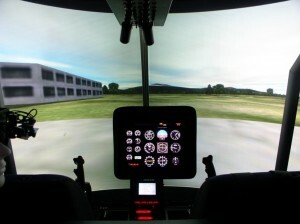 Our Simulator has a screen with a field of view of 175°, high resolution graphics and is equipped with a GSP Garmin 530. With this features nearly any flight can by absolved under photo realistic conditions. We are very proud to be the first civil flight training organization that uses OCRA (Optical Crew Resource Analyzer) during the flight training to improve the method of scanning the instruments of our students. The OCRA System is a fully integrated system which scans and analyses the focus point of the pilot and the movements of eyes. This allows us to give advice the students immediately how to improve their behavior. 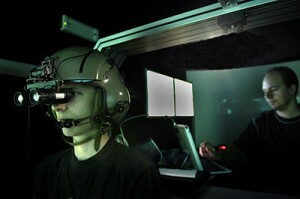 Our simulator is a procedure trainer designed for civil use which allows us train night operations as well. Even with night vision goggles! This allows us to simulate a broad spectrum of operations and various situations which can be dangerous if not trained regularly!